East Berlin’s squatter movement erupted across the city after the fall of the wall in 1989. But what role did housing activists in the 1980s play in shaping an alternative vision for the contemporary city? But who were these squatters? What were the central characteristics of urban squatting in the GDR (goals, action repertoires, political influences)? Why did some East German squatters choose to describe themselves as Instandbesetzer, a term commonly used by Western activists? [v] And, finally, in what way did these practices challenge the dominant model of ownership and control in the GDR and promote an alternative vision of the city? To begin to answer these questions demands a re-thinking of the recent history of radical housing politics in Berlin. The development of the squatter movement in Berlin (Hausbesetzerbewegung) is now well known. While early experiments in alternative forms of communal living in West Berlin can be traced back to the extra-parliamentary opposition of the late 1960s and early 1970s, it is widely argued that there were two major waves of squatting in Berlin. The first was characterized by the development of an alternative scene in West Berlin which, beginning in the late 1970s, responded to a deepening housing crisis by occupying apartments, the overwhelming majority of which were located in the districts of Kreuzberg and Schöneberg. The second was concentrated in the former East of the city as activists took advantage of the political power vacuum that accompanied the fall of the Berlin Wall in 1989. At one point in 1990, over 130 buildings were occupied in various districts in the eastern half of the city. The little work that has been done on squatting in East Berlin in the 1970s and 1980s points, in this context, to an equally significant chapter in a wider history of reclamation and resistance, precarity and protest. It is against a backdrop of persistent housing scarcity, that many citizens – often young but not exclusively so – chose to occupy properties illegally. What Udo Grashoff has recently described as “Schwarzwohnen” (“Illegal living”) can be traced back to the occupation of a small apartment in 1967 in the East German city of Halle. [xii] As Grashoff argues in the only existing study of squatting in East Germany, Schwarzwohnen was not a marginal phenomenon but involved thousands of citizens in the 1970s and 1980s. 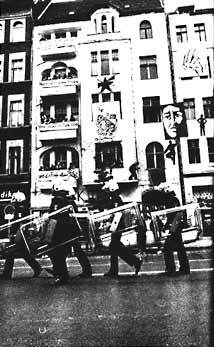 A 1983 report, for example, put the number of people illegally occupying buildings in the Berlin district of Prenzlauer Berg at 800. By 1987, the number had risen to almost 1300. [xiii] While many squatters believed that they simply needed to pay rent to formalize their status, squatting remained illegal in the GDR. State officials were reluctant, however, to carry out evictions as squatters often took pressure off growing waiting lists and, in many cases, returned dilapidated housing stock into use. As the right to housing was enshrined within the GDR’s 1949 constitution, authorities also tended to avoid forced evictions as they would otherwise be legally required to provide alternative housing for squatters. The history of illegal occupation thus points, as Grashoff suggests, to the complex ways in which in an alternative right to housing was articulated in the GDR. If some squatters, including the activists living in Lychenerstrasse 61, borrowed and re-developed, in part, an action repertoire that has its origins in the West, other former squatters spoke of a uniquely East German phenomenon. “Schwarzwohnen” had, so they believed, far more to do with a desire to take control of their own lives and respond to basic housing needs. For some, therefore, squatting formed part of a wider network of protest and resistance. As Wolfgang Rüddenklau, a former occupant of a squatted house in Prenzlauer Berg at number 7 Fehrbelliner Strasse explained: “The islands of occupied flats and houses […] grew together to form a alternative social structure. They affirmed a self-determined lifestyle and developed a common culture.”[xiv] Others detected a more modest challenge to the state and a concomitant impulse to invest the home with a range of meanings that did not necessarily chime with official imperatives. If anything, existing evidence points to a spectrum of alternative practices and tactics that, on the one hand, speak to the importance of housing and the city for the development of oppositional cultures in the GDR and that, on the other hand, anticipate the new wave of squatting that erupted in the winter of 1989. In the end, as scholars turn their attention to the struggles of East German squatters, the challenge must remain one of commitment to the study of what squatters actually said and did. It is, after all, out of a radical attentiveness to the various histories of urban squatting that we might still come to know and perhaps live the city differently. And in the case of contemporary Berlin, a stronger awareness of these histories might still point us to an alternative beyond a city increasingly shaped by the logics of profiteering and privatization, displacement and dispossession. [i] Robert-Havemann Gesellschaft (hereafter RHG), “Behörden erneut gegen instandbesetzte Lychener 61?” Umweltblätter, Nr. 4 (1988), p. 2. [ii] Samizdat is the Russian word for self-publishing and came to be used by dissident circles in the GDR (Samisdat) to describe the production and distribution of subversive texts. [iii] As the Umwelt-Bibliothek was officially part of the Zionskirche parish, it was legally protected by the state-church compact which covered the church’s internal publications. Samizdat publications that were produced under the auspices of various parishes were marked for “internal church use only” (“Innerkirche Information”). See Andreas Glaesser, Political Epistemics: The Secret Police, The Opposition and the End of East German Socialism (Chicago: The University of Chicago Press, 2010) p. 449-450. [iv] RHG, “Lychener Strasse 61 in Berlin-Prenzelberg am Ende?” Umweltblätter, Nr. 10 (1988), pp. 2-3; “Durchsuchung.” Grenzfall, Nr. 14 (1987), p. 2. Umweltblätter was replaced by the journal Telegraph which ran articles in 1995 on the history of squatting in the East Berlin. [v] Instandbesetzer is a term adopted by squatters in Berlin and elsewhere in Germany. It is a combination of the German for maintenance (Instandsetzung) and squatting (Besetzung). [vi] Mary Fulbrook, The People’s State: East German Society from Hitler to Honecker (New Haven: Yale University Press, 2005), p. 50. [vii] Paul Betts, Within Walls: Private Life in the German Democratic Republic (Oxford: Oxford University Press, 2010), p. 124. [viii] Peter Mitchell, “Socialism’s Contested Urban Space: A Study of East German Squatters,” p. 2-3; unpublished ms.
[ix] See Udo Grashoff, Schwarzwohnen: Die Unterwanderung der staatlichen Wohnraumlenkung in der DDR (Göttingen: V & R unipress, 2011), p. 14-15. [x] Mitchell, “Socialism’s Contested Urban Space,” p. 6-7. [xi] Hannsjörg Buck, Mit hohem Anspruch gescheitert – Die Wohnungspolitik der DDR (Münster: Lit Verlag, 2004), p. 344. [xii] The term “schwarzwohnen” offers up no easy equivalent in English. “Schwarz” is the German word for black and the well-known term “schwarzfahren” refers to the practice of fare dodging on public transit. In this context, the choice of the term “schwarzwohnen” highlights perhaps the desire of citizens in the GDR to eschew the complicated mechanisms of official housing allocation. The term “stilles besetzen” (covert squatting) was also used in the GDR. See Mitchell, “Socialism’s Contest Urban Space,” p. 6. [xiii] Mitchell, “Socialism’s Contested Urban Space,” p. 14; Grashoff, Schwarzwohnen, p. 19. [xiv] Rüddenklau quoted in Dirk Moldt, ed. moAning star. Eine Ostberliner Untergrundpublikation, 1985-1989 (Berlin: Robert-Havemann-Gesellschaft, 2005), p. 7. Posted on October 23, 2013, in Europe, History of Anarchism and tagged Germany, Squatting. Bookmark the permalink. Leave a comment.